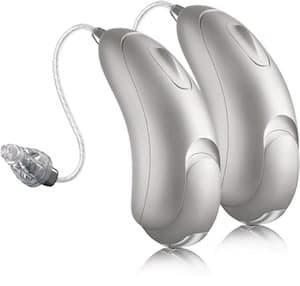 Hearing Aid Subscription program | The new way to try hearing aids. When we started Hearing Group we set out with a mission to help as many people as we could to enjoy life through better hearing. Over our 20 plus years of helping people, we have also come to understand that not every scenario is the same. Some people may be wondering if hearing instruments would work for them and want to try them first, others may be waiting on insurance benefits while some others may need a little financial help. Thus, we put on our thinking cap and created our unique HG Subscription program. This program gives you all the freedom in the world to start hearing better without a long-term commitment and credit checks. The best part is the ability to upgrade your technology level whenever you see fit. With a simple $99 down and your first month’s payment as low as $59 a month, you can walk out the door hearing with a pair of hearing instruments the same day. Your reasons for not hearing have just disappeared! Contact one of our professional hearing experts today to get started. Hearing better has never been easier! “I love it, it’s just an all around good deal with a small payment plan, which is easy. And when new technology comes available, you can upgrade! You also never have to buy batteries, you are always in warranty, all cleaning and programming visits are included and there is NO COMMITMENT! You can go as long as you would like or stop whenever you would like. The HG Subscription program provides you with a pair of state of the art hearing instruments at any level of your choice. We have several technology levels at the most affordable prices to choose from, we highly recommend choosing one that matches your lifestyle. In addition, you can add on streaming options that allow you to stream your TV or cell phone directly to your hearing instruments. Your HG professional will be happy to guide you through the process. -No Application, Everyone's Approved with downpayment and 1st month's payment. -Those not sure if hearing aids are right for them. Try them first without the upfront commitment. -Waiting for Insurance Benefits but want to start hearing now. -Looking for another option other than financing. At Hearing Group it is all about you! The best part about the HG Subscription program is that you have options. All are a winner for you as the patient. Turn them in whenever you’re ready and you can take the amount you have paid during the past year and apply it to your very own set of hearing instruments. Credit is allowed towards equal or higher technology as subscribed for in the past year. You can stay on the program as long as you would like. If you feel that you would like to hear with a different technology level, you can upgrade at any time for an additional enrollment fee. Mention this Coupon and we will waive your first month’s payment. $99 enrollment fee still applies. Better Hearing has never been easier. Let’s talk so we can get you on the road to enjoying life again!